A New Mac Tip Every Day: The warning when emptying the trash! 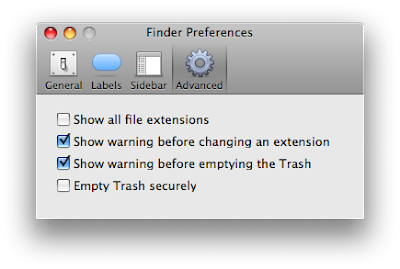 It is actually possible to get rid of the warning when emptying the trash in the Finder preferences. Most people don't realize that the Finder actually has a separate preferences window. I guess we always assume that everything about the Finder is done in System Preferences. "Preferences..." is actually right there in the "Finder" menu. That is where you can disable the empty trash warning in the "Advanced" tab. It think getting rid of this warning really makes sense now that everything is backed up and fully recoverable with Time Machine. Or if you're a keyboard whore like me, using cmd+alt+shift return. Would any body know what does the (Empty Trash securely) mean.. !? In my understanding, it means that there will be 0s and 1s written over the deleted data and it won't be recoverable even with special software (whereas normal emptying just marks the space taken up by the data as 'available'). "...really makes sense now that everything is backed up and fully recoverable with Time Machine." as long as you've shelled out the cash for an external method that works. I won't be happy with/be able to use Time Machine until I can use my Linux box harddrive as the Time Machine storage location. Not sure you should assume everyone is using Time Machine.